This fixture last year was pivotal to the Gunners’ top four aspirations, whilst the Blues’ had their minds firmly fixed on a certain Champions League semi final second leg. Not a classic in any fan’s eye, this stalemate saw Chelsea sit deep and frustrate Arsenal, despite making eight changes to the team that beat Barcelona at Stamford Bridge days before. Roberto di Matteo, on the verge of one of his greatest managerial achievements at Camp Nou, brought in Ryan Bertrand, Jose Bosingwa and Oriol Romeu along with an entirely new midfield and forwards in a 4-3-3 formation. A real nail in the coffin of Andre Villas Boas tenure at Chelsea Football Club, came at the end of a week that saw John Terry accused of racial abuse at Loftus Road, and came a second straight defeat for the Blues’. Turbulent times at Stamford Bridge, that saw Petr Cech’s goal breached five times, Robin van Persie netting a hat trick in a game soaked in defensive frailty. This game will be remembered for all the wrong reasons for Chelsea. A miserable Christmas period continued at the Emirates for Chelsea, as 10 minutes of pure self-destruction handed Arsenal the spoils. Song, Fabregas and Walcott split Chelsea apart before Branislav Ivanovic attempted to make a game of it. Carlo Ancelotti’s champions mid season stutter contributed entirely to the handing over of the title to Manchester United, although they would recover to finish second in the league, three points ahead of their North London rivals. 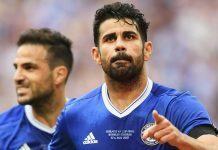 A Didier Drogba spin and a boomer of a free kick from Alex saw Chelsea take advantage of some guilt edge misses from the Gunners’. Chelsea tightened their grip at the top of the table in the early stages of the season, Drogba netting in pirouetting fashion and an Alex classic free kick took three points in a match Carlo Ancelotti didn’t attend following the death of his father. Chelsea and Arsenal fixtures tend to follow John Terry sagas. When Arsenal visited the Bridge in February 2010, Didier Drogba settled a trying week for the Chelsea skipper, having been stripped of the England captaincy by Fabio Capello. The big Ivorian continued his fine goal scoring record against Arsenal, latching onto a Terry flick before cutting inside and smashing past Almunia to heap misery on Arsene Wenger’s men. Carlo Ancelotti’s men set a precedent early on in their title winning campaign, beating the Gunners’ at the Emirates. Ashley Cole had his say at his old stomping ground, swinging in a ball in for Drogba to flick past Almunia before the same ball deflected of Vermaelen into the Belgian’s own net. The game was completed in pure bliss as a typical Drogba free kick left the Arsenal keeper rooted in the dying embers of the match. Chelsea secured a top three finish in a turbulent season for the Blues’. Guus Hiddink salvaged Chelsea’s season after the sacking of Luiz Felipe Scolari, the performance at the Emirates’ showing how far the Dutchman had taken the team. Goals from Alex, Anelka, Malouda and a Kolo Toure own goal satisfied the Chelsea faithful after going out in devastating fashion to Barcelona midweek. This FA Cup semi final at the New Wembley was settled late on through Arsenal’s tormentor Didier Drogba. Theo Walcott had put the Gunners’ ahead early on, before a Florent Malouda drilled in an equaliser. Lampard sent a ball over the top in the 86th minute, and the Chelsea frontman shrugged off Mikel Silvestre before rounding Fabianski, netting in front of the Chelsea fans. Chelsea would go on to win the final against Everton. Chelsea’s miserable run under Luiz Felipe Scolari was epitomized by the home defeat courtesy of two Robin van Persie goals in 2 minutes at Stamford Bridge. His first, a certain offside offence was then shadowed by a superb turn and finish inside the area. After four years of impenetrability at Stamford Bridge under Jose Mourinho, the final whistle provoked an orchestra of boo’s aimed at Scolari’s naïve tactics. Jose Mourinho never lost a game to Arsenal, but Avram Grant fell at the first hurdle, weeks after the Portuguese’s departure from West London. Ex-Chelsea defender William Gallas headed the only goal of the game, in a poor game in North London.